I can’t believe it’s nearly Chanukah again already! The Chanukah bunting and dreidel decorations are up, the cushions are out, the table runner is on display, my daughter is flipping felt latkes and leaving dreidels all over the floor while I clean up to the sound of our Chanukah compilation CD. It’s just as well I made all these things earlier, because I started a university degree this year and study has taken away almost all of the time I used to spend crafting. 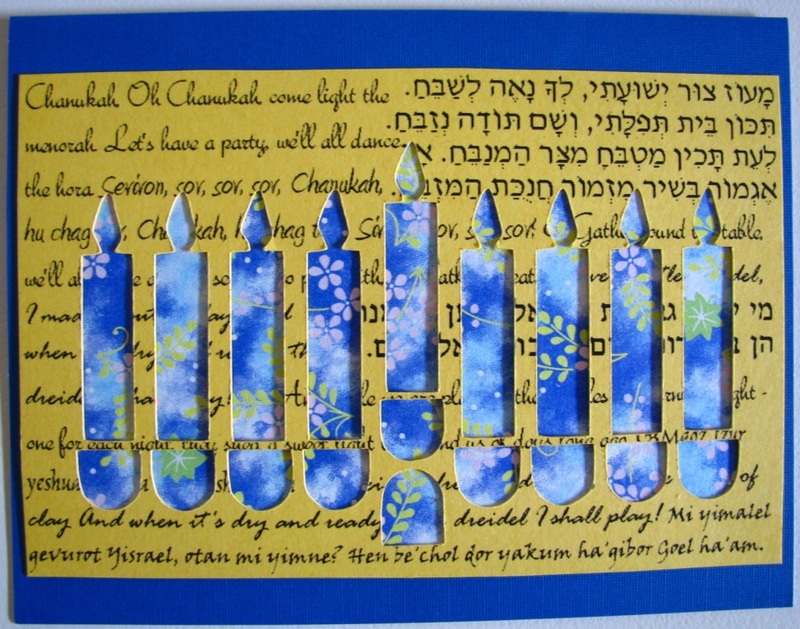 So all I have to show off that is new are this year’s Chanukah cards. 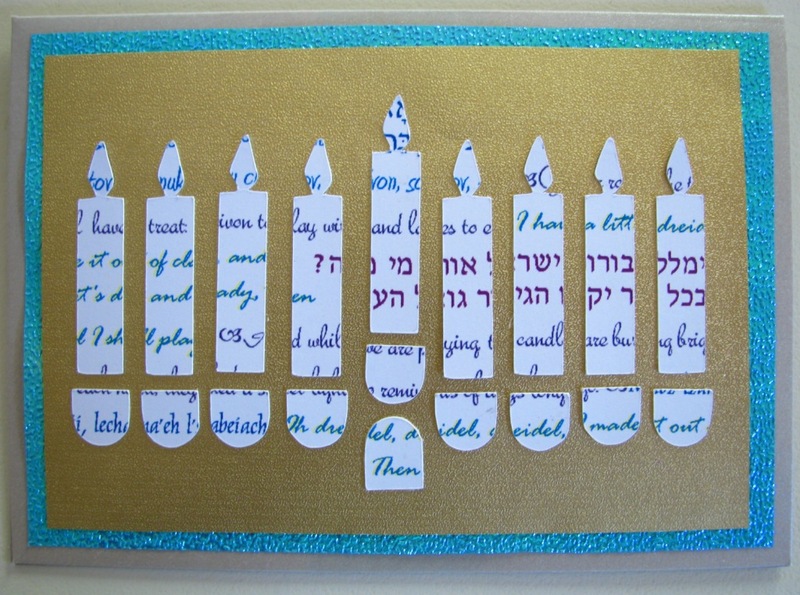 After last year’s dreidel cards, I decided to use my silhouette cutter again. 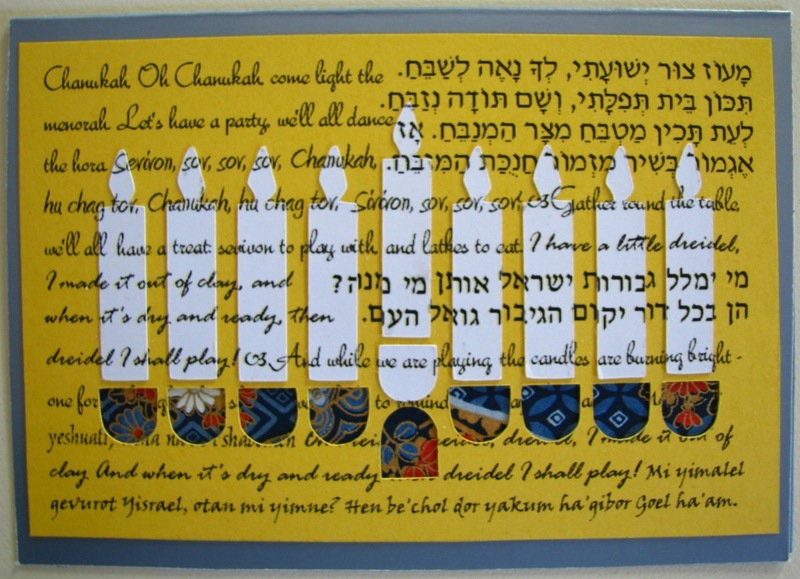 I designed a chanukiah (Chanukah menorah) to cut out, and a background of Chanukah lyrics to print on the card before I cut it out. 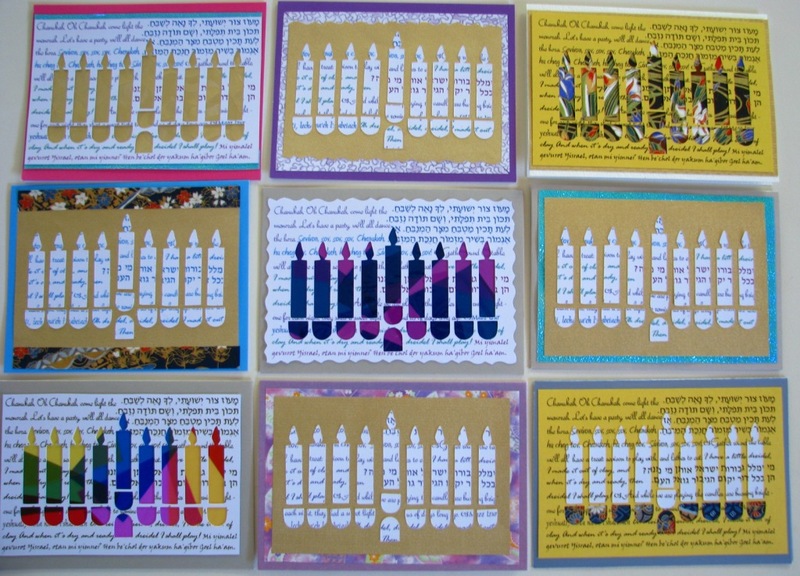 This means that I get two sorts of cards – one with the menorah cut out, and the other with the pieces that were removed. It leads to lots of mix and match games involving random pieces of Japanese paper, gold foil and cellophane. I particularly like the cellophane stained glass window effect. Gluing down all the candles (in the correct order so that you can still make out the lyrics) was not so exciting, but it seemed crazy to waste them. 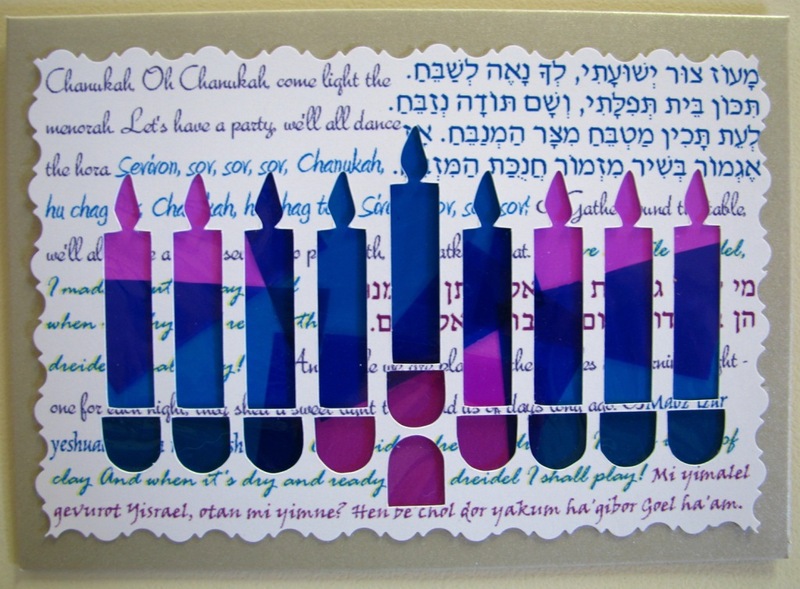 Sticking one piece of colourful paper behind the menorah silhouette was a lot faster! And here is a cross section from earlier in the week. I’ve made quite a few more now, but need to be writing them and posting them, not just talking about them on here! 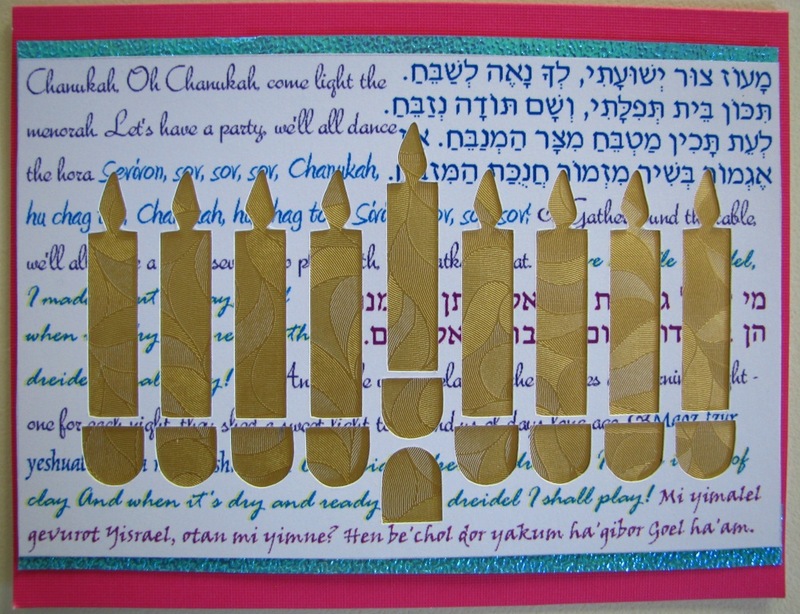 If you receive handmade cards at Chanukah (or any other festival), here’s a tip: don’t recycle them all like you probably do with mass-produced cards. Keep the most beautiful ones to display again in future years. Ours are blu-tacked to the wall, but I have a friend who pegs hers to the edges of her curtains. And keep a sample of your own work to display by giving one to someone who lives in the same house as you. (I write a card for my daughter.) It’s such a joy to look back at cards that were really made with love. 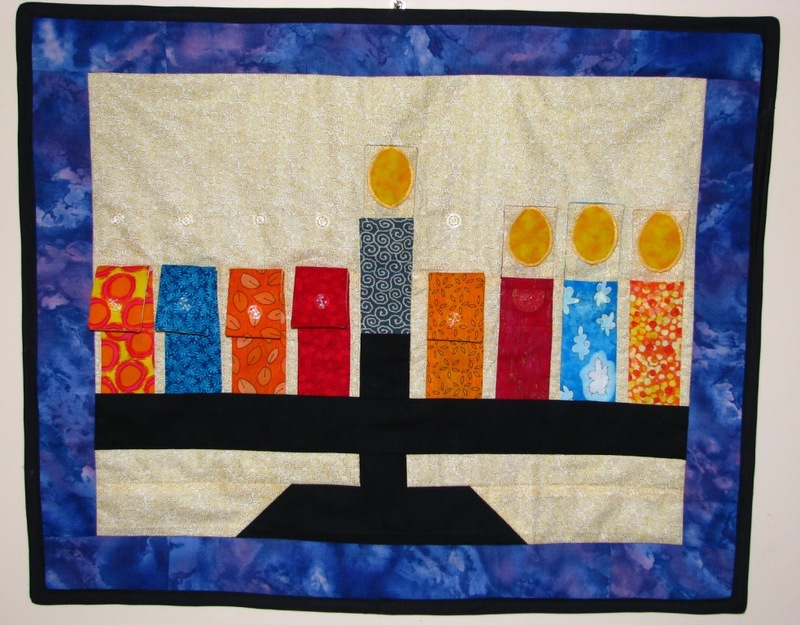 My plan: to make a wall hanging depicting a chanukah menorah (chanukiah) with flames that would fold up as you “lit” them each night, revealing a small pocket in which to find a piece of gelt (chocolate coin). What happened first: my original design (which I thought was quite elegant) did not have candles wide enough to accommodate the chocolate coins I wanted to hide in them, and if I scaled the design up so that the candles were wide enough, the entire thing was simply way too big. So I turned that design into a challah cover. What happened next: I ended up making a wall hanging dictated by the width of the candles and the design was a lot less glamorous, at least in part because I made it up as I went along rather than starting with a pattern. I used clear plastic press-studs to hold up the flames. You can just make out the pockets, which are a square at the top of each candle. It took me a day or two to design/cut/machine sew the thing together and about 5 weeks to make myself hand sew 18 press-stud pieces. If I was making it again (which, trust me, I am not going to do) I would change quite a bit. But it does hold gelt, which makes it extremely popular with the youngest member of the household; and if she’s happy then I’m happy too. I know it’s not good manners to covet, but when I first laid eyes on my friend (The Bible Belt Balabusta) Joanna’s AWESOME pool noodle and stubby holder chanukiah, I knew I had to own one myself. 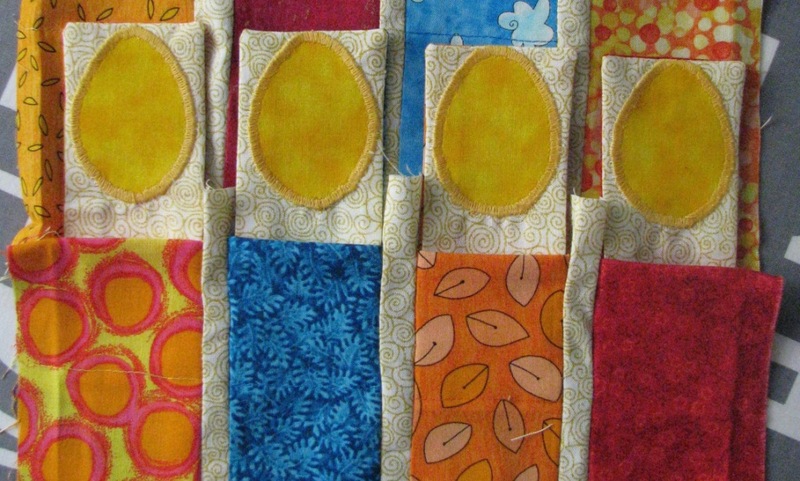 Lucky for me (and you) she has kindly provided step-by-step instructions for making your own! 1. As it’s nearly summer in Australia it is extremely easy to find pool noodles. However, as I discovered after purchasing some likely specimens, not all of them will fit into a stubby holder. So I recommend taking a sample stubby holder with you on your noodle buying expedition, otherwise you may find yourself suddenly equipped with a couple of extra Chanukah gifts to give away. 2. 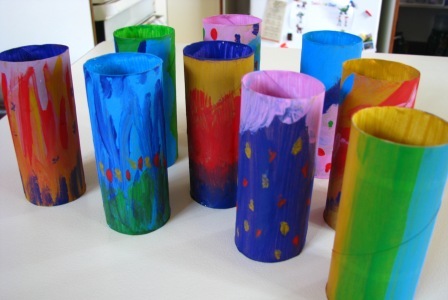 I would have loved to use plain coloured stubby holders, but I’m not sure you can actually buy them retail in Australia. I could only find decorated ones, many of very dubious tastefulness. In the end I sought advice from my daughter’s pre-primary teacher, who directed me to an educational art and craft supply store where I was able to find white ones. We might paint them next year. 3. Even my husband, who claims not to like craft of any description, enjoyed helping make this. I bought a piece of pine from Bunnings, 1.2m x 9cm x 1.8cm, he cut off three 9cm lengths to raise the shamash, and put everything together. 4. I made flames out of foam like Joanna’s, but they kept tipping over backwards. I had the idea of wrapping the foam around a popstick, and that helps keep the flame upright. 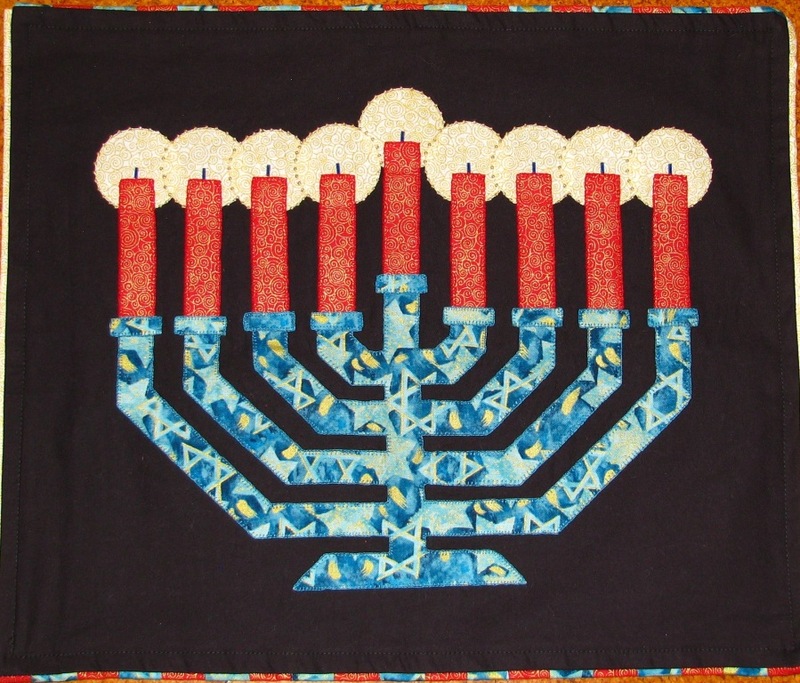 This is part one of the story of two chanukiot (chanukah menorahs). 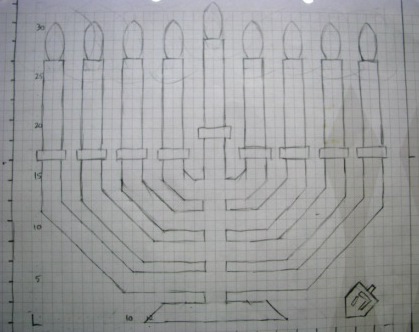 I really wanted to sew a wall hanging of a chanukiah, so I designed a lovely nine-branched menorah on graph paper and scaled it up. As will become apparent later, this design turned out to be the wrong size for my planned wall hanging – but I still liked it. So I decided to make it into something smaller: a challah cover. Yes I know they usually have a Shabbat theme, for obvious reasons, but I have plans for a number of festival themed covers so we can change them over as we move through the year. 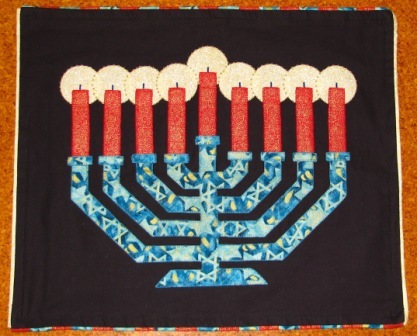 In my haste to get the project underway, I cut out the menorah from a lovely teal blue/gold fabric which, I discoved later that day, clashed with every other piece of fabric I had intended to cut the candles from. I was about to throw it out and start again when my husband said “that would look great with red”. I’m not sure that anyone else has ever used red chanukah candles, but when we lived in the UK a decade ago, nowhere near a Judaica shop and well before it became easy to buy anything and everything over the internet, we used to buy candles that were perfectly sized for our chanukiah from our local Asian food shop. 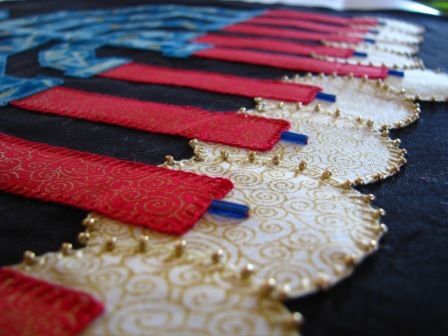 They were very good quality, and they were red, a symbol of good fortune in their country of origin. In the end, the whole project had quite an oriental flair to it, with the dramatic use of dark colours – a striking contrast to our existing white challah cover! 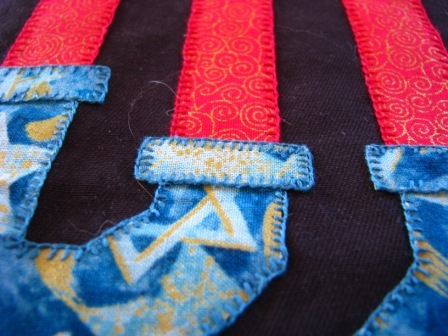 This is my first effort at a hand appliqued project. 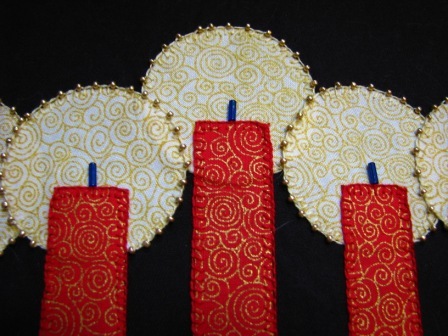 My stitching was a little variable, but I enjoyed incorporating some beads for the wicks and around the candlelight. And here is the finished product! 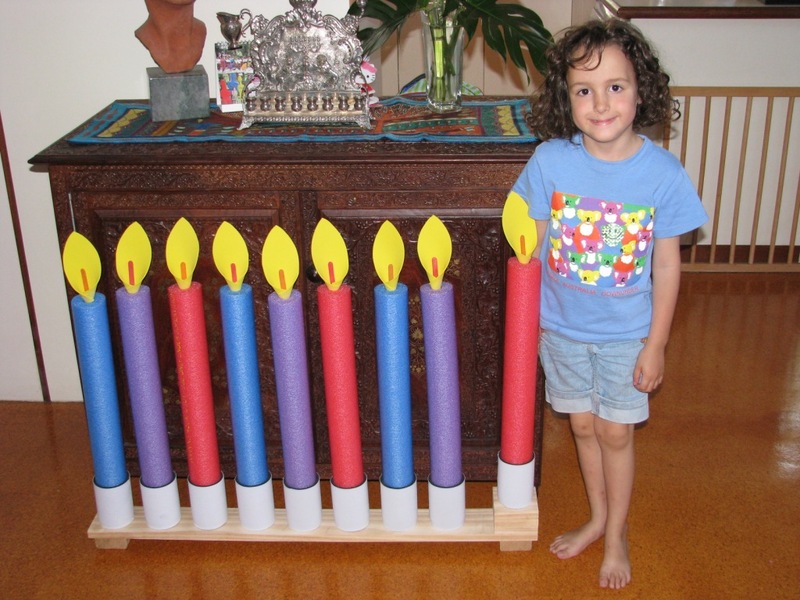 Weeks before Chanukah I planned to make a chanukiah out of toilet roll tubes. 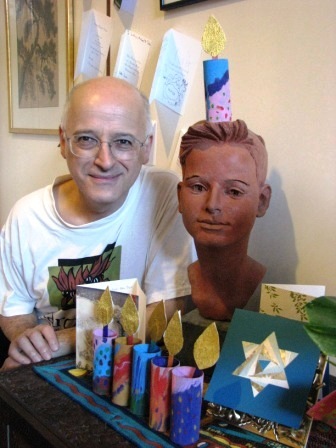 Then I saw one made by Creative Jewish Mom which was so elegant I nearly gave my plans away! 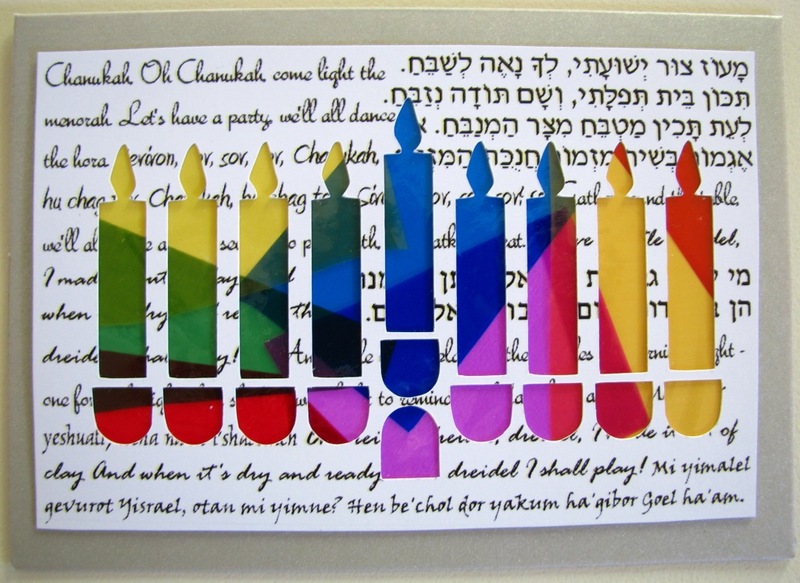 But my daughter and I both enjoy getting the paints out, and so this colourful and very easy to make cardboard chanukiah came into being. Actually although I originally intended to link the tubes together, it is currently a loose collection of “candles” which can be arranged however the mood takes you. 1. 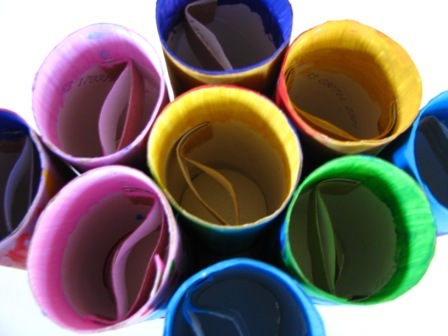 Collect your cardboard tubes, and paint or otherwise decorate them. 2. 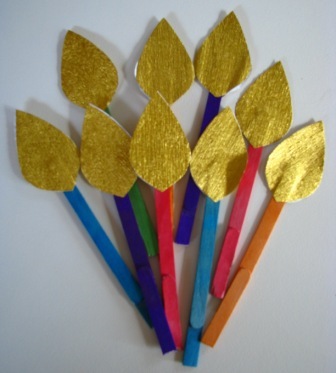 Cut out flames from gold paper and stick them together over the top of popsticks. My popsticks were a little too short so I broke some in half and glued them on as extenders. 4. 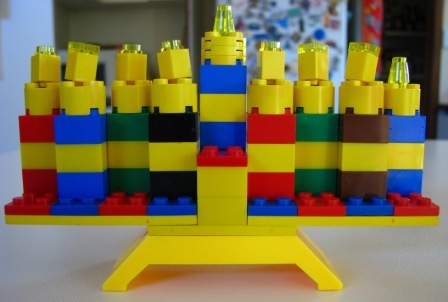 Assemble and “light” during Chanukah. 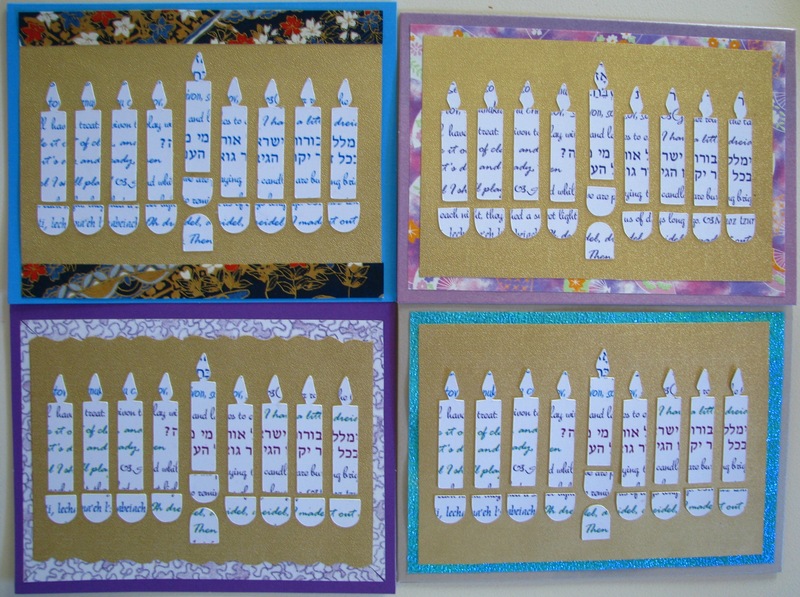 Don’t forget to place the shamash a little higher than your other candles. I have been inspired and entertained by the creative ideas from Jewish Everyday. 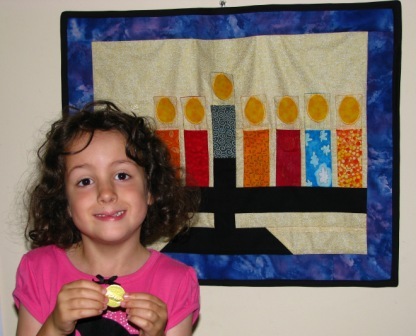 Joanna dreams up fabulous things to do with lego, including dreidels and menorahs, almost none of which involve the possibility of setting anything on fire. So today we pulled out our box of random lego pieces and put together this little menorah, which now sits on our mantelpiece between two silver heirloom chanukiot. Go on, make your own – you know you want to! My daughter Talia attends a public kindergarten for 4-5 year olds. Parents take turns helping out for a couple of hours, and my husband and I were “on duty” last Thursday. 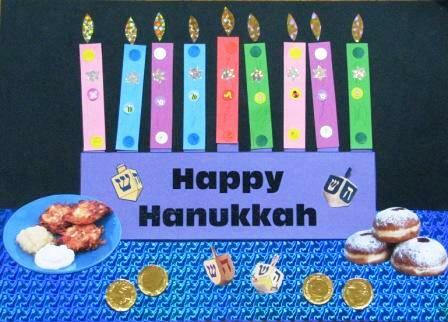 A week earlier, I asked the teacher what she had planned for us to do, and she invited us to talk to the class about Chanukah. So we did! It was really nice to share our traditions with a group who, apart from our daughter, knew nothing about them. We took in a stack of little dreidels for the kids to try spinning, which they loved, and (having just learned the alphabet this year) they were fascinated by the Hebrew characters on them. We also dished out some chocolate gelt, because frankly that was easier and less mess than making latkes! I will definitely volunteer to talk to Talia’s future classes about this and other festivals in future, and hopefully next year we can get the whole class doing some Hanukkah themed craft to display next to all their Christmas decorations. A resource site for anyone who wants to share the joy of being Jewish with the children in their life. 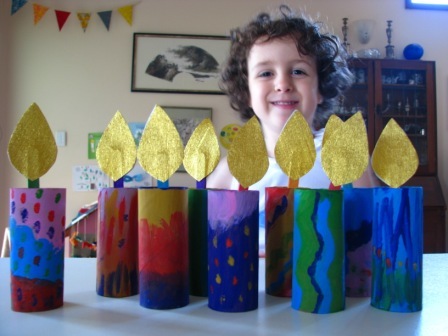 Creative Jewish Mom Some beautiful ideas! 10 commandments Achashverosh apples book review cardmaking challah challah cover Chanukah chanukiah children collage decoration decorations dreidel Esther flowers fun with fruit fuse beads game gardening with children gragger growing seeds indoors guestbook Haman Hanukkah havdalah Hebrew honey Israel Jewish fabric Jewish life Jonah latkes love lulav magen david mask matzah megillah mobile Mordechai Moses Mt Sinai music New Year no-dirt gardening Noah's Ark papercraft parents passover Pesach plagues poem popstick puppets Purim Rosh Hashanah seder sewing Shabbat Shavuot shehecheyanu shofar silhouette cutter Simchat Torah star of david sukkah Sukkot torah toys Tu B'Shevat word hunt word search Yom Kippur You can eat this!